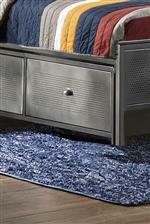 Contemporary metallic construction meets old school simplicity in the unique panel bedroom set. Constructed of metal in a slick, black steel finish. 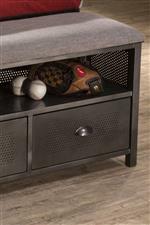 The casepieces have a black steel metal finish with wood accents in antique cherry. The bedroom collection is the best of both worlds. Its punched hole detailing brings a utilitarian flair to this versatile style, while its numerous drawers and storage areas bring the practicality. Available with or without under the bed storage drawers. The Urban Quarters Four Piece Set with Full Panel Storage Bed by Hillsdale at Conlin's Furniture in the Montana, North Dakota, South Dakota, Minnesota, and Wyoming area. Product availability may vary. Contact us for the most current availability on this product.